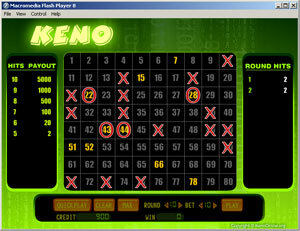 At this page, you can download the Keno software for free. Keno Online is released as a Freeware, zero cost, no Advertising banners popup, no real money deposit nor withdrawl, and since it's a completely free software, theoretically, I don't provide any support. We love your feedback and comments, and if you have any questions about the keno game or software itself, write me a note, I will try to help as much as I can. If you don't have a high-speed Internet connection, you can leave the page with keno game always open and play as long as you can, the game only loads once when opening the page, and does not need the Internet connection any more once it's fully loaded. The benefit to play on the Flash version is that it supports both Mac and Windows platform, but the download version only works on Windows. Click the below screenshot or click here to download the keno software directly. We do NOT encourage any form of real money wagering. Like many other games, our keno is Free and for entertainment ONLY.